Having a non-lethal tool like a good, strong OC spray (oleoresin capsicum) is a useful part of your defensive toolkit if it’s legal in your jurisdiction. This is how it can be used effectively! Do you carry one? If you value what we do at ASP, would you consider becoming an ASP Patron Member to support the work it takes to make the narrated videos like this officer ending the fight with a good dose of OC Spray? https://get-asp.com/patron gives the details and benefits. There isn’t news stories on this one, as it was sent to me by a fan who gave me permission to use it to help us all. It was recorded in Honolulu, HI on April 28, 2017 around 1PM. What does this video teach us about using OC Spray as part of a strategy to defend ourselves? Pepper spray is an excellent tool and should be in every self-defenders defensive repertoire (I carry Sabre Red), but it is not a panacea. It works on 85-90% of people; about 10-15% of people are simply immune to Oleoresin Capsicum. Part of training with OC is also being sprayed with it and learning that you CAN fight through exposure if you know what to expect and you have good emotional fitness, and some attackers have both. So if you carry pepper spray, know its limitations and know that you don’t get what you want with it all the time. The shop owner in this video has seen some stuff as a member of the Peshmerga, and he isn’t having it from this robber! Do you think he was smart to spray him? If you value what we do at ASP, would you consider becoming an ASP Patron Member to support the work it takes to make the narrated videos like store owner teaching an armed robber some lessons? https://get-asp.com/patron gives the details and benefits. Pepper spray (also called OC or OC spray) can be a very useful defensive tool for non-lethal threats. I carry this one, and it’s nasty stuff: http://amzn.to/1kxJpls . It can also be used against you in a fight, so you should know how to defend yourself if you’re sprayed! Take a good course on pepper spray and how to employ it, and as part of that course take a dose yourself so that you know the effect it will have on you and how to fight through it to continue to protect yourself. I don’t recommend it against a firearm! This manager did a good job fighting off the effects of the pepper spray! (notice what it did to the customer) He also teaches us all some good lessons about firearms and self-defense. Do you think about defending yourself after being sprayed? If you value what we do at ASP, would you consider becoming an ASP Patron Member to support the work it takes to make the narrated videos like this manager chasing these robbers off? https://get-asp.com/patron gives the details and benefits. 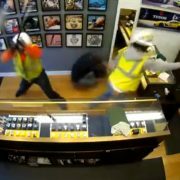 What does this video teach us about defending ourselves against an robbers? Pepper spray (also called OC or OC spray) can be a very useful defensive tool for non-lethal threats. I carry this one, and it’s nasty stuff: http://amzn.to/1kxJpls . It can also be used against you in a fight, so you should know how to defend yourself if you’re sprayed! Take a good course on pepper spray and how to employ it, and as part of that course take a dose yourself so that you know the effect it will have on you and how to fight through it to continue to protect yourself. We always assume that armed robbers are not concerned with our safety; this is why our Active Self Protection needs to be strong and ready! If you value what we do at ASP, would you consider becoming an ASP Patron Member to support the work it takes to make the narrated videos like these armed robbers? https://get-asp.com/patron gives the details. 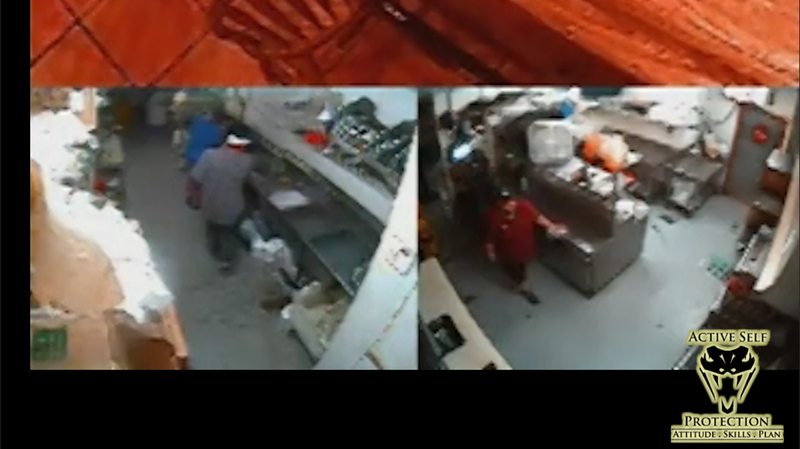 What does this surveillance video teach us about defending ourselves against armed robbers? If you can win “the fight before the fight,” you win. You win that fight by minimizing your potential for being attacked in the first place! That means making smart decisions and living a life of awareness and readiness so that you don’t take unnecessary risks. That includes locking the back door of the restaurant so that armed robbers don’t use it to ambush you! In any territorial or predatorial violence, the attacker gets to set the time and circumstances of the attack. They will almost always launch that attack from ambush, or as we like to call it in Umas, from “obscurity.” Surviving that ambush is one of the most important keys to successfully defending yourself. 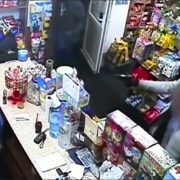 These armed robbers ambushed the first victim pretty good; he had little time to respond, but the second did! I think it’s valuable for every self-defender to carry OC Spray (pepper spray) as a defensive tool for non-lethal threats. I have used mine on dogs more than once effectively. Like any tool, OC spray is not 100% effective at stopping a threat; that said, against most people, it is a fight stopper! If you take a quality class you will be exposed to the spray so that you know how it affects you and affects others. That is NOT a fun time, but it is an important one. As the adage goes, the chief ingredient in OC spray is fear, so if you’re trained and prepared you CAN fight through it to still defend yourself. (I carry this one: http://amzn.to/2en1PEh) These armed robbers used the OC spray against the victims, which is another reason to know how you will respond! Do you carry pepper spray as part of your defensive toolkit? I am a big fan of pepper spray for non-lethal threats, but it’s not a perfect solution as this officer shows. This sad video is an important reminder at Active Self Protection of the limitations of all the tools we carry, especially our pepper spray. 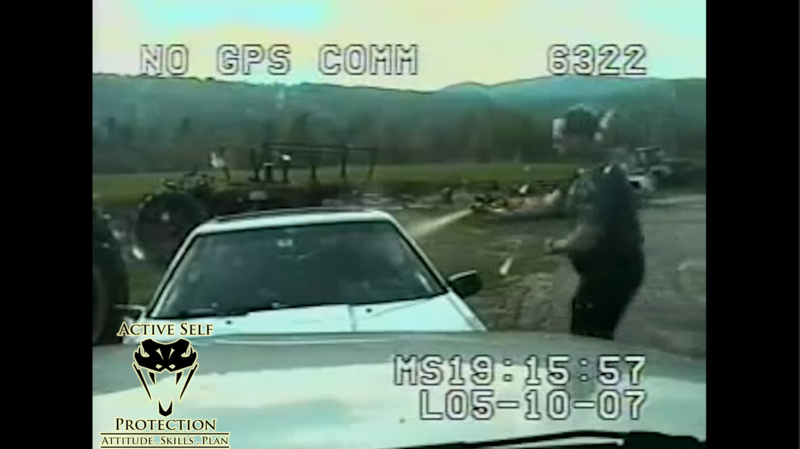 Original video of the pepper spray failing is available in our Instructor Development Portal. 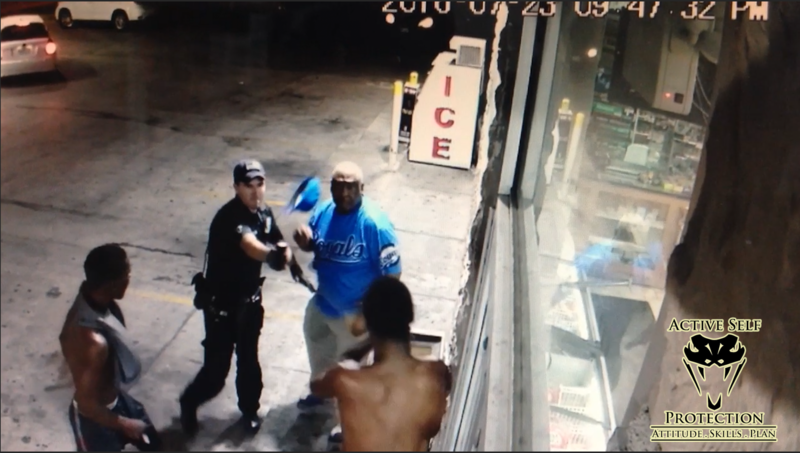 What does this officer teach us about how and when to use pepper spray to defend ourselves? In a deadly force encounter, decisions of life and death will be made in the blink of an eye. On the range and in class we have time to consider and to think and to reset and to make multiple attempts, but when the balloon goes up in real life you’ve got fractions of seconds to decide what the best course of action is to protect yourself. The way to be better at decision making in the heat of the moment is training, specifically scenario training and force-on-force training that is designed to work on decision-making skills under stress. It’s offered all over the country, so get training! Corporal McKay was expecting his pepper spray to subdue the suspect, but it changed SO fast and he had little time to react. This is the reality of life and death exchanges. Spiritual fitness is an important part of Active Self Protection. You don’t often get any advance notice of the last day of your life, but we see over and over that self-defense isn’t a guarantee of winning every fight you might be placed in. You want to be at peace with your loved ones and with God, because you’ll need that peace on the day that you meet Him. Since you can’t guarantee advanced notice, make peace today. Corporal McKay didn’t go to work expecting his pepper spray to fail and cost him his life; let’s all take that as a lesson to be ready for today to be our last day. Even if you’re injured, you must stay in the fight and not stop as long as you have consciousness. The human body is designed to take a ridiculous amount of injury and still function, so never stop fighting just because you’re injured! Even if you’re shot or stabbed, you have a 67-95% chance of surviving! (https://get-asp.com/ew3l and https://get-asp.com/p0hn give the details) So practice emotional fitness by knowing that even if the bad guy gets the jump and you’re injured, you’re still in the fight and still likely to survive if you take definitive action to protect yourself. There’s no telling which injury it was that actually killed Corporal McKay, but staying in the fight is the only way to go. Do you carry pepper spray as part of your defensive toolkit? This guard shows us how it can work to de-escalate a conflict and end a fight, making it a useful part of your Active Self Protection! Original video of the pepper spray use is available in our Instructor Development Portal. It was sent to me by the security officer in the video, and details are from him. What does this security officer teach us about defending ourselves using pepper spray? Pepper spray (also called OC or OC spray) can be a very useful defensive tool for non-lethal threats. I carry this one, and it’s nasty stuff: http://amzn.to/1kxJpls. I asked the security guard in this video what he carried, and it is the same Sabre Red (just a different can). It can also be used against you in a fight, so you should know how to defend yourself if you’re sprayed! Take a good course on pepper spray and how to employ it, and as part of that course take a dose yourself so that you know the effect it will have on you and how to fight through it to continue to protect yourself. The eyes may be the windows to the soul, but the hands are the windows to the intent of a person. If you’re in a potential conflict, ALWAYS pay attention to what the aggressor is doing with their hands. They might have a force multiplier in their hand, or they might be hiding their hand so that you can’t see what is in it or using their hand to conceal something. If their hands are empty, there is a difference between someone with fists and someone whose hands are open and relaxed. As a self-defender your situational awareness must include seeing the hands of any potential threat in your vicinity, so watch the hands! Before the pepper spray came into the fight, the hands of the aggressors showed what they were planning. Don’t ignore the hands! Using your verbal judo to de-escalate and redirect a conflict is always the best choice if it is available, so make sure that your verbal game is strong. Knowing how to redirect, how to persuade, how to empathize, and how to talk someone down from a confrontation is critical to avoiding some fights. The pepper spray is the NEXT tool, but this security officer did a fine job of using his verbal judo first! We must also know that some people will not be dissuaded from a fight, so knowing when to talk and when to act is critical as well. Part of your training must be knowing when to use verbal commands, and when to abandon verbal commands and move to physical or deadly force. Many times self-defenders (and LEO) get caught in a loop of issuing the same command repeatedly to no effect. Using verbal commands is an important part of your force options training, and part of that training in verbal commands is knowing when to talk and when to stop talking and act. The security officer had to know when to stop talking and use the pepper spray, and he did a fine job of that here! 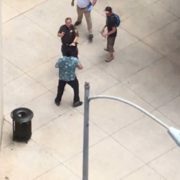 What does this brave student security guard teach us about defending ourselves against an active killer like this? Evil exists in our world, and no amount of wishing it away does so. Evil people do evil things, and good people must be ready and willing to stand between them and innocent people and do enough violence to stop them definitively. No amount of negotiation will make truly evil people change their ways; only those willing and able to stop them who use attitude, skills, and plan effectively can. This active killer was deranged and bent on killing people. He succeeded once and doubtless would have succeeded again if he wasn’t stopped by the brave student. You must accept that danger exists and that it can happen to you. This is the foundational core of spiritual fitness and the first step in taking proactive steps to protect yourself and your loved ones. If you live in a fantasyland that nothing bad can happen because nothing bad has happened in the past, you’re setting yourself up for a terrible letdown. Most of us live our lives thinking that an active killer like this could never happen to us, and for most it won’t happen. But if it does, you need to be ready. Active killer situations are unfortunately no longer unheard of, and being ready to defend ourselves as this student was is critical. To defend against this kind of attack, you need emotional fitness. Emotional fitness is defined as the ability to internally represent a situation or predicament to yourself in such a way as to make you strong and able to successfully defend yourself against it. Repeated practice and thousands of reps of sparring and self-defense absolutely build your emotional fitness to be able to handle whatever comes your way. Meis had incredible emotional fitness to counter-ambush the active killer and put a stop to his attack. Nicely done!! As well-meaning as police officers are, they cannot protect you from danger. As the old adage says, “When seconds count, the police are only minutes away!” You—and ONLY you—can protect yourself from danger when it comes upon you. A police response time of 5 minutes is considered perfectly acceptable in most suburban departments, and times upwards of 30 minutes can be the norm in rural areas! You need to have the attitude, skills, and plan to protect yourself from harm because the police simply can’t. Imagine how many people this active killer could have shot if an unarmed student didn’t step in and end it. 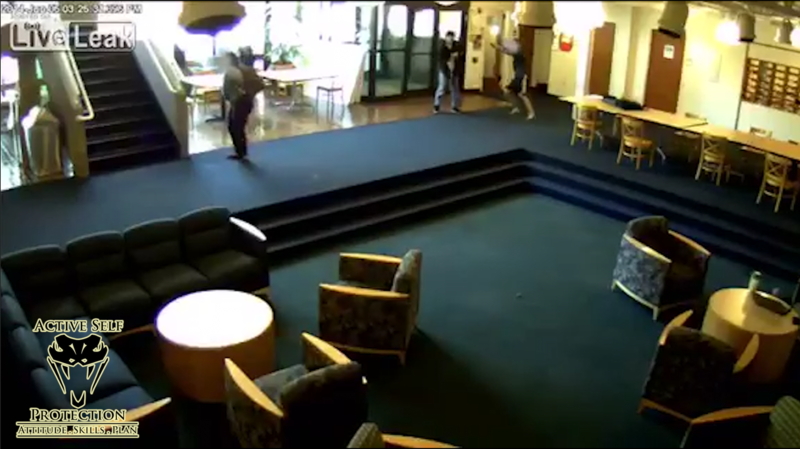 Successful self-defense against many attacks involves a counter-ambush, where the victim (or bystander, as this student was) finds the right opportunity to seize the initiative from the active killer and launch an ambush of their own. That involves thinking and knowing your own strengths and skill set, and being ready to strike the attacker when your opportunity for counter-ambush comes. It also means not allowing the attacker to see that attack until it’s launched. Against an active killer, the most popular paradigm for defending yourself is Ready Houston’s Run-Hide-Fight approach. If you can get out of the danger zone, run. If running is not an option, hide because the bad guy won’t shoot what he can’t see. If running and hiding are not an option, then fight with everything you have with whatever you have on you. Greg Ellifritz has some good thoughts about the limits of the Run-Hide-Fight mentality, which to me are more discussion of its limits than whether it is useful or not. This active killer was stopped because the student was willing and ready to fight. The Five Ds are a tool that we use at ASP to organize our training and preparation for defending ourselves against an armed attacker when we are not armed ourselves, such as happened against this active killer. (or if we are armed but outdrawn such that we must deal with the problem with our hands) Deflect, Dominate, Distract, Disarm, Disable. We pursue them from first to last, in order, to give us the best chance of successfully defending ourselves against an armed opponent. Deflect their force multiplier, Dominate as much as possible (best is the whole person, second is the arm with the tool, last is the tool itself), Distract the attacker (usually using pain, redirection, movement, etc. ), Disarm the attacker, and Disable the attacker. Pepper spray (also called OC or OC spray) can be a very useful defensive tool for non-lethal threats. I carry this one, and it’s nasty stuff: http://amzn.to/1kxJpls . It can also be used against you in a fight, so you should know how to defend yourself if you’re sprayed or exposed like this student was! Take a good course on pepper spray and how to employ it, and as part of that course take a dose yourself so that you know the effect it will have on you and how to fight through it to continue to protect yourself. I wouldn’t like to fight an active killer with a pepper spray, but if it’s all you have, use it effectively. When your kids are with you, does your defensive plan change? I hope your kids are integrated into your Active Self Protection and that you consider what needs to happen when they’re with you if you have to defend yourself! This lady got lucky that her kids weren’t hurt. What does this video teach us about getting involved in third party incidents? Parents must consider their children in their defensive plan. The younger the child, the more the parent(s) must consider how holding or dragging their child will affect their ability to protect both of them. Naturally, the more children you have the more you’ll be constrained in retreat or running, and the more you’ll have to “stick your foot in the ground” and defend yourself without retreat. 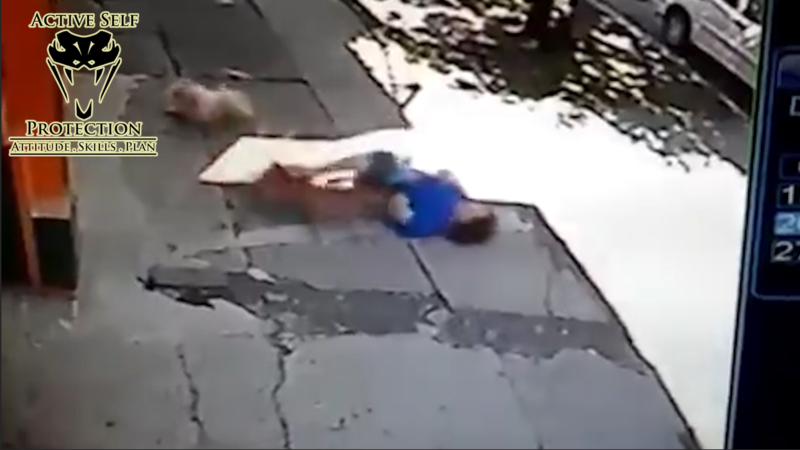 The thief here targeted the mother not the kids, but the kids were very much in danger. Having a plan for what your kids will do if you have to defend yourself, communicating it, and practicing it with your children is indispensable. As each of us considers whether to be a Good Samaritan and step into encounters that do not directly involve us, we must consider the implications on our lives and families. Does your desire to step in override your duty to your spouse and children and loved ones? Or is it part of your care for your family to protect others wherever you can? I think it’s commendable that this woman wanted to protect the elderly lady from a thief, though her attitude was much bigger than her skills or plan. Empty-handed skills are absolutely critical for self-defenders. First of all, more conflicts you will encounter as a self-defender will require empty-handed skills than will require firearms skills, simply because more self-defense encounters are physical than deadly. Second, since a firearm is a tool of last resort, self-defenders need to have non-lethal options that include empty-handed skills to protect themselves from likely incidents. Third, in the moment of the encounter you may not have the time to get to your gun before you can fight your way to it. While in the US we MIGHT be able to argue that she could reasonably be in fear of death or great bodily injury, that is not at all established for certain. 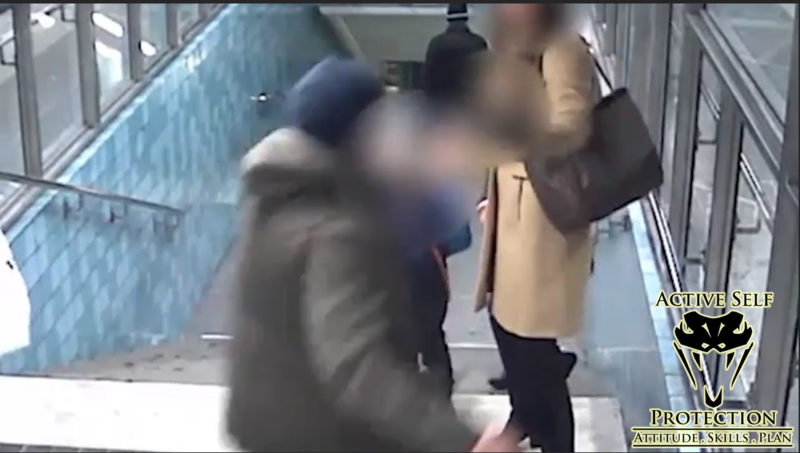 Regardless, some significant empty-handed skills would have allowed this woman not to have taken that attack. Pepper spray (also called OC or OC spray) can be a very useful defensive tool for non-lethal threats like this one, though of course you must follow local laws. I carry this one, and it’s nasty stuff: http://amzn.to/1kxJpls . It can also be used against you in a fight, so you should know how to defend yourself if you’re sprayed! Take a good course on pepper spray and how to employ it, and as part of that course take a dose yourself so that you know the effect it will have on you and how to fight through it to continue to protect yourself. When would you have taken decisive action against this man who threatened so many? Practicing Active Self Protection means knowing when the right time is to act, and the right actions to take! 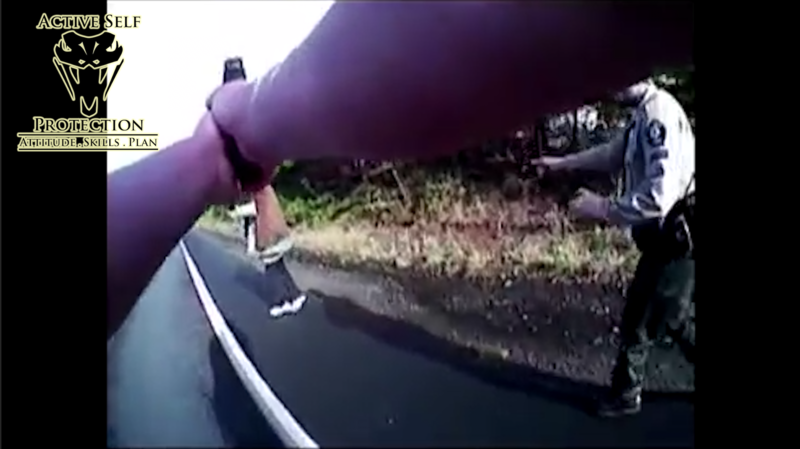 So many times officers get scrutinized incredibly carefully, but body cam footage like this shows us how difficult it can be to decide exactly when to act. What does this officer involved shooting teach Law Enforcement Officers and Armed Citizens alike? Whether you’re LEO or CCW, you need to know what force options you have available and when to abandon one and move to another. (“force options” are a better model than the older “force continuum” model) You need to know when your pepper spray is the best option, or when to abandon it (or the TASER) in favor of your firearm in a split second decision. The best way, of course, to learn and embed these options in your mind is to train in force on force scenarios with the options and then respond to the situations appropriately. Our goal as self-defenders is to stop the threat. We are not vigilantes and we are not out to kill, we seek to stop the threat against us. Shooting to wound will not stop the threat reliably, and neither will shooting an attacker in an extremity. The only reliably means to stop an aggressor who means us death or grievous bodily harm is to put shots in the center of their available mass to cause nervous system collapse or bleeding out. (exsanguination is the technical term) Here after the first volley it was not at all clear that the threat had stopped, though of course the officers have to use care in not using too much force in the current environment. Shoot until the deadly threat is past!